Hello and welcome back! So sorry I had to miss another Wednesday blog post but I had a god awful sinus headache for about six days in a row and needed to take some time off from writing and editing because the the sinus pressure was so bad (and I supposedly don't have allergies...LIES). Today I thought I would share my photos and talk about the trip that I took with Contiki last year since today just so happens to be the one year anniversary. I don't think I mentioned this in my post recapping my trip with EF College Break but I got to go on this one with Contiki for free because I won a sweepstakes with ASOS and the prize was the Italian Espresso tour with Contiki. I very randomly saw a post on ASOS's Facebook page announcing the sweepstakes and how to enter and all you had to do was use a specific hashtag on a vacation photo over on an Instagram post. There were three options for the trips; Italy, Croatia and Costa Rica. I went for Italy since I loved it so much the first time around and Costa Rica and Croatia didn't interest me all that much. It was super easy to enter and it was a sweepstakes, not a competition, so the winners for each trip were chosen at random. I just went back and added the hashtag to a photo from my EFCB trip and that was that. I never in a million years thought I would win and I freaked out and started physically shaking when they messaged me on Instagram to tell me I had won. I got to pick which date I went on and my first option was canceled because not enough people had signed up so I ended up going about a week or two earlier than what I had originally chosen. If you read my post on my EFCB European Road Trip adventure then you'll know that this was my second time going to Italy and was by far my most favorite travel experience that I've ever had. I'm not going to go into extreme detail on this one, more of an overview, and then at the end I'll give you all my thoughts on the company and if I would recommend them compared to EFCB. I've already rambled on a lot so let's get to it! Note for desktop readers: If you want to enlarge an image all you have to do is click on it and then to exit lightroom click the "x" on the top right corner. Map of the trip: two nights in Rome with a partial day in Vatican City on our way to Florence, three nights in Florence with visits to the Chianti Region for wine tasting and exploring in San Gimignamo, stops in Pisa and Verona on the way to Venice where we stayed for two nights. Out of the three cities we stayed in Rome was my least favorite because it's a lot more spread out and is more difficult to get around. It was still really cool though and I'm glad I got to see the city but I'm in no rush to go back. I live in such a typical suburban area that is completely cookie cutter so whenever I go anywhere I'm always blown away by the architecture and how different it is. I got to go to the Trevi Fountain and toss my coin, saw the Pantheon but do not have any great photos because I made the grave mistake of only bringing my nifty 50 mm lens and that was just a terrible decision on my behalf. I brought it because it's so much more lightweight than my 24-105 mm lens but my imagery suffered big time and it was a lesson learned for sure. Of course the Colosseum was on the agenda (those photos are iPhone panoramas) and that was pretty crazy. I could not believe how big the steps were, one step off the ground nearly came up to my knees. I minored in art history in college and took a class on Greek and Roman art and archaeology so getting to see some of the places I studied in that class just kind of blows my mind and is pretty crazy to think about. The Vatican was absolutely swarming with people as you would expect so I did not take very many photos because of that and because it was difficult to get a shot I liked with the lens I was working with. Don't get me wrong, it was cool to go there but not a place I care to go back to. My favorite thing that I got to do in Rome, and of course I don't have any photos to show for it...#fail, was the pasta cooking class that nearly everyone in the group took (this group was just over 40 people as well). I think I was pretty slap happy because of the lack of sleep and jet lag but I just remember laughing a lot and getting to talk to a lot of different people in the group so it was a very fun evening. Rome is totally worth seeing but I don't think you need to spend more than a few days there to check all the major spots off on your list. Florence was probably where I had the best time. Because we had so much free time I fell into a group with people from Scotland, Sweden, South Africa and Australia. That in of itself was pretty cool for me getting to make friends and hang out with people from all over the world (Contiki trips are people from all over the world and EFCB was just people from America). Florence is absolutely stunning and I'm so glad it was the city that we stayed the longest in. The Cattedrale di Santa Maria del Fiore (Florence Cathedral) was so beautiful but I ended up with some photos of really weird but cool angles of the building since I couldn't fit very much of into the frame with my lens. One evening we had a group photo with the city as the backdrop and the view was stunning and those are two of my favorite photo from the whole trip (sadly I don't have the digital file of the group photo from that evening or any group photo to share this time). That same night we had a huge group dinner where we celebrated a birthday and a wedding anniversary and then went out to a club afterwards but being the grandma that I am I had to tap out early so I could try and get some sleep. 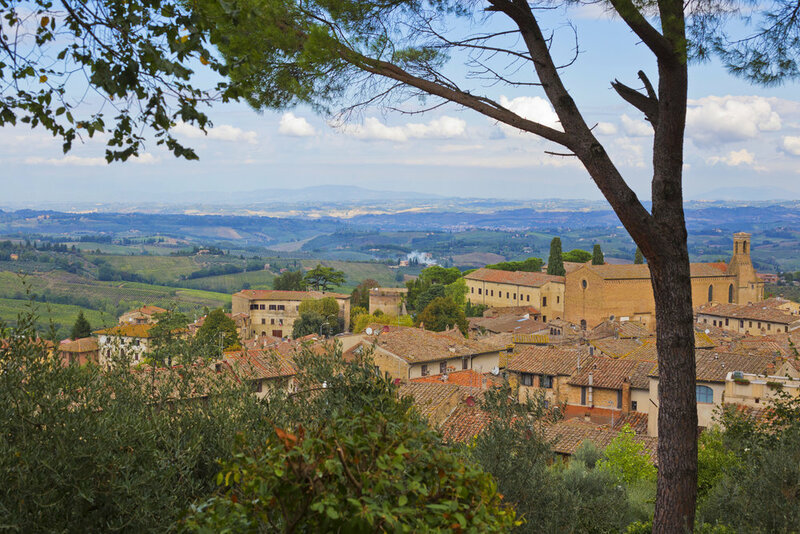 The next day was pretty packed because we started it in San Gimignano which is a quaint medieval town and then from there went to a Tuscan Winery in the Chianti Region. After arriving back in Florence, a small group of people and myself went to The Galleria dell'Accademia di Firenze (Gallery of the Academy of Florence) which is where Michelangelo's David sculpture is and then ended the final evening in Florence with a steak dinner of about half the people from the trip which was graciously arranged by the Tour Director, Chiara. Florence is incredible and is the number one place that I've been to in Italy that I would recommend to visit. The next day we had several stops on our way to Venice in Pisa and Verona. Pisa is a complete and utter mad house. Fair warning to anyone going there, the street vendors are complete vultures and are incredibly pushy. There was an extreme amount of tourists there so I'm glad we were not there for long. I got my photos, had lunch and then we left. If Pisa is on your bucket list then sure go and see it but it's not a must-see or a place that I'd highly recommend. I didn't take too many photos of Verona since I'd been there before and the few photos I did take had people in them so I'm not going to share those here for privacy reasons. Had a lot more free time in Verona this time around and got to go into a small castle and then had a group dinner before leaving for Venice. Again, didn't stay in Venice proper because it would be incredibly expensive so we were inland but I expected that this time so I wasn't let down by that. The way the map at the beginning is laid out makes it look like you get two days in Venice but really we only got one since we arrived so late in the evening but at least this time it was a full day and not a half day like EFCB. Venice does have a crazy amount of tourist but I still love it. I didn't take a ton of photos that day either so that's why there's not very many here but I did sneak a photo, or so I thought, of a gondolier off duty. We did a walking tour and a lot of people did the gondola ride but I opted out since I'd already done it and I'm not the biggest water person. There was a lot of free time in Venice as well so we got to have lunch on our own. Got to do a bit of shopping because our farewell dinner in Venice was a masquerade and everyone had to get masks (I also got my Ray Ban sunglasses in Venice). I was having a really hard time finding a masks that fit over my nose and ended up buying one off a friend that had bought two because time was running out and I still hadn't picked up one yet (I wore it on Halloween last year which you can see by clicking here). During the farewell dinner the most gorgeous sunset came out and that is probably my favorite photo that I took on the whole trip. Venice was even more fun the second time around and I would 10/10 recommend if you can handle the excessive amount of tourists. Overall the trip was pretty incredible and I'm so fortunate that I got to go to Italy twice within a year. I had a great time and met some amazing people that I still keep tabs on so I wouldn't change it for anything. That being said, I kinda wish I had chosen the trip date in October just because I wanted to go when it was more fall-like weather since I'm not a summer person but that's me being very nitpicky. If you're thinking about traveling with a company and have EF College Break and Contiki as potential option on your list I would 100% recommend Contiki. There was so much more free time, which I didn't think I would want, but that ended up giving me some great exploring opportunities (like seeing the David). The only thing I like better about EFCB compared to Contiki was that we got travel passes which made it much more easy to get around. With Contiki we were either on the bus as a group being dropped off at places or walking if our hotel was close enough to the city like it was in Florence. The accommodations for both companies were nothing spectacular but you can't expect anything too fancy since they are budget trips and at least with Contiki I only had one roommate the whole time whereas I had up to five other roommates on my EFCB trip. Also, with Contik you can book your airline tickets through them or do it on your own which is particularly good if you or a family member have airline miles that you want to use so that is another thing to think about. I have had some health issues come up this year that have kept me from traveling but I want to go to Spain and Greece next and have already bookmarked the specific tours that I want to do with Contiki. I will definitely be traveling again with them sometime hopefully within the next year so it is a company that I would recommend and use again since I had such a positive experience. I'm going to stop myself there or we'd be here all day but if you have any questions please do not hesitate to ask. I hope you enjoyed today's post and thank you so much for visiting and have a lovely day!